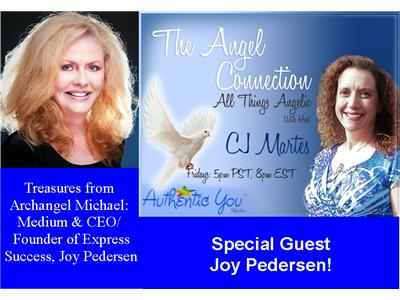 CJ welcomes Joy Pedersen to her show this week. Joy was a part of corporate America before her life changed dramatically when Archangel Michael appeared to her asking her to channel/write a book for him called Wisdom of the Guardian. Listen in to hear about this life-changing event and what Joy has learned from the Angels . Dr. Joy S. Pedersen, CEO and Founder of Express Success, is a Licensed Spiritual Healer, Certified Spiritual Health Coach and Certified Law of Attraction Practitioner, as well as a noted business consultant and networker with a celebrated international clientele. She works closely with individuals and businesses of all sizes to overcome their challenges with money, relationships, career, business, health and well being. Using both 21st Century technological advances and established, time-honored spiritual techniques, her work includes clearing negative memories, property and karma. She is also the author of Wisdom of the Guardian: Treasures From Archangel Michael to Change Your Life. For additional background, visit www.ExpressSuccess.net.